DENVER, COLORADO ( May 10, 2016 /EINPresswire.com/ ) — Most days blurred past retired police officer Jennifer Fortezzo in a haze. After leaving law enforcement due to injuries received in the line of duty, she has been plagued with numerous after-effects of traumatic brain injury (TBI), a condition previously thought to be untreatable. 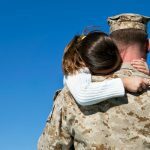 But in March 2016, Fortezzo found a new treatment that the latest in science shows may reverse brain damage, and restore normal functioning to injuries caused by TBI. So, instead of donating her brain for research after she dies — like several celebrity athletes are doing — she joined the “Say Goodbye TBI” campaign. Now she seeks to raise funding and awareness for this new treatment, which could help millions of others suffering TBI-related conditions. The new treatment is spearheaded by Drs. 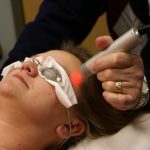 Theodore Henderson and Larry Morries, co-Founders of the Neuro-Laser Foundation, who are on the forefront of studying the effectiveness of treating TBI patients with a specialized method using high-powered, multi-watt near-infrared light (NILT). Dr. Henderson said Fortezzo is an excellent candidate for NILT because her brain scans show multiple brain injuries, and PTSD, probably connected to years of sports participation in addition to her work-related injuries. Fortezzo served as a Law Enforcement Officer for the Colorado Springs Police department for 10 years, until she retired in July 2014 due to injury sustained in the line of duty. A self-described “Tomboy,” she has always enjoyed participating in various athletics. She said she has always been “the type of athlete that sacrificed my body, including my head, for the sake of the game.” She also recorded many previous concussions. She is married with two daughters (14, 9) in Colorado Springs. Fortezzo was diagnosed with major depression and PTSD after the death of her daughter in 2006. Since then, she has struggled with progressively worsening memory issues, anger and rage, anxiety, severe depression, suicidal ideation, obsessive-compulsive thinking and difficulty thinking clearly. While seemingly unbelievable, the changes in Fortezzo’s life are backed up with science showing NILT regenerates the healing process among damaged brain cells. Mrs. Fortezzo has not been compensated for her remarks. With millions of TBI survivors, and various other possible applications for NILT, this is one of the hottest topics in neuro-science today, according to Dr. Henderson. This news originally appeared here.